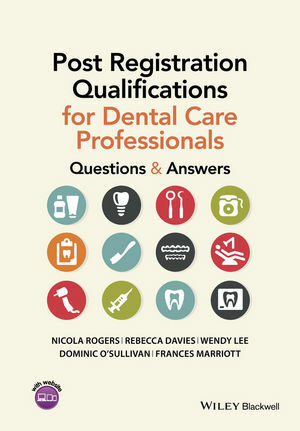 Post Registration Qualifications for Dental Care Professionals: Questions and Answers is a comprehensive revision aid for dental nurses seeking to gain post-registration certification for professional development. Nicola Rogers is a Dental Nursing Tutor at the Bristol Dental Hospital, Bristol, UK. She is the author of Basic Guide to Dental Sedation Nursing (Wiley-Blackwell, 2011). Rebecca Davies is a Consultant and Honorary Senior Lecturer in Dental and Maxillofacial Radiology at the School of Oral and Dental Sciences, Bristol Dental Hospital, Bristol, UK. Wendy Lee is a DCP Tutor and Orthodontic Therapist at the Bristol Dental Hospital, Bristol, UK. Dominic O'Sullivan is a Professor in Restorative Dentistry at the School of Oral and Dental Sciences, Bristol Dental Hospital, Bristol, UK. Frances Marriott is joint Director of Focus Oral Health CIC in Plymouth, UK providing an oral health education and information service for inter-professional and community audiences.